Some results of the shutdown? Farmers have been unable to secure USDA loans. Three people have died while visiting our currently-unstaffed national parks. And thanks to the shortage of TSA agents at airports, a passenger managed to make it through security and onto a flight with a gun in his bag. I can’t speculate about the identity of the official. I can’t speak to the validity of his/her complaints about government inefficiency — I’ve never been a federal government employee (although my husband is one). But I can safely say that, no, things are not working better without them. We’re less informed about what’s going on in our own country. How’s our economy doing? Are the Trump tariffs actually working? Is it a good time to buy a house, start a business or invest in the stock market? No one knows. As the Brookings Institution reports, “The people who collect, analyze and release all the basic data tracking the path of the economy and its principal aspects are on furlough.” Ordinarily, businesses and consumers rely on these reports to make critical and informed decisions. That’s why the First Amendment protects public access to this information. But there’s not a lot it can do when there’s no information to access. Businesses can’t communicate with their customers. Last week, D.C. brewery Atlas Beer Works filed a lawsuit claiming the shutdown is violating its First Amendment right to speak to consumers. The Alcohol and Tobacco Tax and Trade Bureau can’t review and approve Atlas’ new labels for its seasonal beer, the brewery can’t ship its kegs interstate without those labels and in the meantime 40 barrels of perishable, apricot-infused India pale ale might go bad. You may scoff at the idea of a beer label as free speech, but as Atlas’ lawyers point out, “It cannot sell, and no one will purchase, random, unidentified liquids.” The requirement for a government agency to review this sort of communication protects consumers from the harm that false or misleading labels could cause. Prominent First Amendment court cases have ground to a halt. While the courts are still operating, many of them have suspended work on civil cases involving U.S. government lawyers, among them the Pen American Center’s First Amendment lawsuit against President Trump. While the majority of the Department of Justice (DOJ)’s lawyers are still working during the shutdown, they’re a bit overtaxed right now. 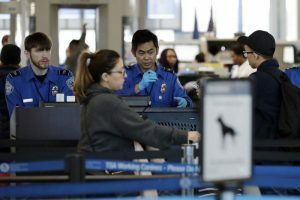 Just last week, they had to contend with a lawsuit brought by several groups of federal workers against the government for forcing them to work without pay. The DOJ lawyers defending the government in court were also working without pay. To add insult to injury, there are limits to how they can express their displeasure about this. A law, the Hatch Act, prohibits federal employees from engaging in political activity when they’re at work and new guidelines have stated that hanging up a “resistance” poster or advocating for impeachment falls into that category. But while there’s been some concern that the new guidelines are too restrictive on the speech of federal employees, the Hatch Act is grounded in a noble purpose. It was passed to protect federal employees from political coercion and ensure their advancement is based on merit and not political affiliation. At the heart of this is a belief in the value of career civil servants, people who are experienced in the way that government runs and do their jobs to the best of their abilities regardless of who’s in power. That’s why it’s disheartening to read the anonymous Trump official’s call to “weed out saboteurs” in the government, or President Trump’s tweets that most of the federal workers going without pay are Democrats (implying he has less of a reason to care about the shutdown than his Democratic opponents in Congress). He’s using partisan terms to dismiss hundreds of thousands of people who have sworn to do their jobs in a non-partisan fashion. This entry was posted in Inside the First Amendment, News and tagged First Amendment, free speech, Inside the First Amendment by Lata Nott. Bookmark the permalink.